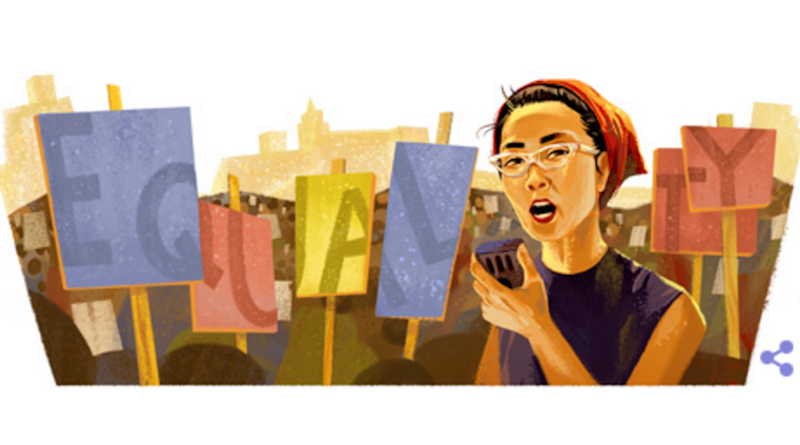 Today’s Google Doodle honors the birthday and legacy of Yuri Kochiyama, one of the most overlooked and dogged civil rights activists of our time. Kochiyama was born, according to her 2014 L.A. Times obituary, to Japanese immigrants in San Pedro, California, where she lived until her family was forced into an internment camp following the bombing of Pearl Harbor. She and her husband ultimately moved to Harlem where, with a full understanding of what it’s like to have one’s civil rights and dignity violated by their country, she became an activist and ally for the black community and many others. Perhaps most famously, she developed a relationship with Malcolm X and joined his Organization of Afro-American Unity. Many remember her from the famous image of her cradling his head as he lay dying. Throughout her life, Yuri Kochiyama fought for countless causes including reparations for Japanese Americans interned during the war, Puerto Rican independence and worked to free Mumia Abu-Jamal. She was a friend of Assata Shakur and taught English to immigrants, volunteered at homeless organizations in New York and worked to combat bigotry and profiling against Muslims. She died on June 1, 2014 at the age of 93. She shares her birthday today with her friend Malcolm X. If you’re in the mood for more celebration, check out this ode to Kochiyama by the Seattle hip hop duo Blue Scholars. Images via screencap/Google.com, AP Images.